Today, September 28, 2018, The Indiana State Nurses Association is hosting among its keynote speakers a nurse who was in the national spotlight late last year. You may remember the July 2017 story about Alex Wubbles, RN, the Salt Lake City nurse who was caring for a patient in the University of Utah emergency room when a detective entered the room, insisting that Nurse Wubbles draw blood from a patient. There was no physician order, warrant or patient consent for the demanded action pursuant to the facilities policies and procedures. Upon refusing the demand, Detective Jeff Payne roughly handcuffed her, removed her from the emergency room and strapped her into the police car. You can see the detectives body cam video of this incident by clicking on this sentence. The patient Nurse Wubbles was treating was an off-duty reserve police officer driving a semi when he was hit by a man in a pickup truck while fleeing police. The patient never was a suspect and there was no basis to draw his blood. The abusive detective was wearing a body camera which showed the entire incident. He was later fired by the police authorities. While Nurse Wubbles settled her case, the embarrassment and shame of this kind of harassing and wrongful imprisonment was completely inexcusable. Ms. Wubbles will be one of the keynote speakers before the Indiana State Nurses Association on ending nurse abuse initiatives. She believes that what happened to her can lead to positive change in the nursing profession. She is working with the ANA to stop this culture of violence. In January 2018, she testified before the Utah House of Representatives stating that this type of abuse toward health care providers must stop. The bill requires that police who would like blood drawn from anyone must have the person’s consent, or a physician’s order, warrant or court order. In Utah, it takes only 10 minutes to get a warrant. 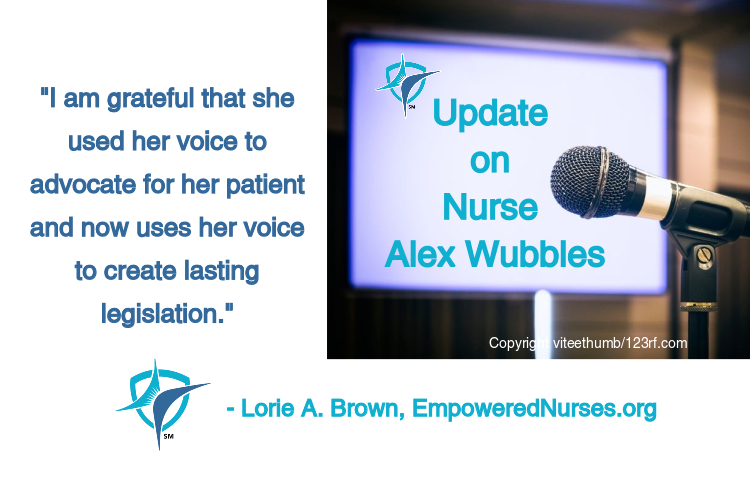 While I am pained that Nurse Wubbles suffered this detestable situation, I am grateful that she used her voice to advocate for her patient and now uses her voice to create lasting legislation. While many of us may be afraid to speak up for fear of retribution, speaking out is the only way for change to occur. I for one applaud the continued effort of Alex Wubbles in advocating for patient safety. What initiatives does your facility have to help nurses advocate for patient safety? I would love to hear your comments below.